Ms. Bindu K. Nambiar, Assistant Professor in Marketing is a rank holder in MBA from Madurai Kamaraj University. She is also a rank holder in BA English Literature from North Bengal University. She was a lecturer in RAI College, Ernakulam and has come to us with corporate experience at Everonn Systems India, a Chennai based educational institution which has tie up with Hughes Software. She has several research based publications to her credit and has presented papers in National International seminars. Job responsibilities - Marketed Hyundai cars in Ernakulam district , Led a team of Sales Executives, Designed and maintained a database of contacts, Relationship building with existing clients, Exceeded sales targets set by Hyundai Motors India Ltd. Faculty Mentor for last seven years and have mentored over 100 students. 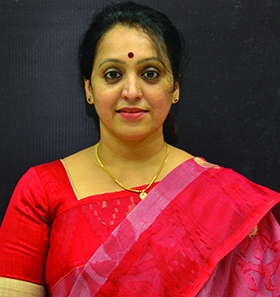 Faculty Coordinator at Emerging Kerala 2012, Global Connect, a Kerala State Investor Meet, 12-14 September, 2012. Coordinator for the Corporate Social initiative ‘Parivarthana’ wherein students are taken to secondary and higher secondary schools to educate school students with socially relevant topics like Drug abuse, obeying traffic rules, social media usage etc. Academic advisor/trainer for a startup training enterprise called Trainers4tomorrow, 4tune factory Kochi, Kerala. Mentor for a Retail store namely Arma Silver Jewellery at Lulu Mall, Kochi, Kerala. Marketing and Brand Conclave, conducted by CII on 2 November 2016. Case Teaching Methodology by Harvard Business and IIM Ahmedabad at IIM Ahmedabad campus, 22-23 Oct, 2016. CASE TEACHING&quot; workshop held at Cochin University of Science &amp; Technology, Kochi, May 20th & 21st 2016. Two days Faculty Development Programme on Teaching Methodologies by Global Head –Talent Transformation, BPS Division of Wipro at Kochi, 1 - 2 April, 2016. Two days silver jubilee summit on “What’s Coming Next” by International Advertising Association (IAA) Global in Kochi,4-5 September,2015. International Conference on Indian Financial Sector on the Global Financial Landscape at SCMS Cochin School of Business, 31-1 January, 2014. Two days National Seminar on ‘Emerging International Business Order’ at Cochin University of Science &amp; Technology, Kochi, March 30-31, 2012. Women Managers Conclave on 21st Century Women – Architects of Change, Ernakulam, 31 Oct, 2012.
International Workshop on Managing Challenges in Emerging World Order and Winning Strategies for Sustainable Development, Bharat Mata Institute of Management, Kochi, August 2011. Faculty Development Program on ‘Mentoring Skills for Teachers’ by Dr. P.R. Chandramohanan. Three Day Faculty Enrichment Program on Research and Statistical Analysis for Management Using SPSS conducted by Mr. R.Sriram, Statistical Consultant, anf Faculty at IIT Madras at SCMS Cochin School of Business on Dec 1,2,3 , 2011. J-Gate training program at SCMS Cochin School of Business, June 28, 2012.
International Conference on ‘Green Management in a Warming World: Challenges and Opportunities’ held in association with British Council, Chennai at SCMS Cochin School of Business, 20-21, March, 2009. 7 days intensive training on Course Content Development and Design covering topics like technology of adult learning, assessment validation and evaluation, categories of knowledge and skill, mastery learning resourced by Shri. S. Venkatesan and Shri.N.Palaniappan at Munnar, 11-16 May, 2009. Two days DelPHE sponsored Multi-Country Workshop on Micro-Finance –Gender and Poverty organized by SCMS Cochin School of Business, 7-8 December, 2009. Nambiar, B.K., Joseph, A. and Nair, R.V. (2015). Adoption of CRM Initiatives in Retail Banks: Reshaping the Customer Centric Model in Kerala, International Journal of Management and Social Science Research Review (IF 3.029), ISSN – 2349-6738. Nambiar, B.K., Joseph, A. and Nair, R.V. (2014). Adoption of Information and Communication Technology in the Banking Sector: Services Augmentation of the ATM Marketplace as a Customer Channel in Kerala, International Journal of Multidisciplinary Educational Research (IF 2.9), ISSN: 2277-7781. Nambiar, B.K., and Sing N. (2011) ‘A Quantitative Analysis of the Favourability of Sensual appeal in advertisements among Youth in India’ published in Indian Journal of International Business and Finance, International Science Press, ISSN: 09756132. Nambiar, B.K. (2009) ‘Managing Brand Integration in this Economic Slowdown’ as a CEEMAN’s and IPM’s 2 nd International Conference on Leadership and its Role in preparing the Organisation for Unprecedented Change edited by Dr. Anita Mathew published by Excel India publishers. Nambiar, B.K. (2009) book review on ‘Marketing’ authored by Michael J.Etzel, Bruce J.Walker, Wiliam J.Stantion and Ajay Pandit, 2009 edition, SCMS Journal of Indian Management. Nambiar, B.K. (2010) ‘A Study on the Impact of Frequent Communication of Competitive Pricing on Consumer Perception while Purchasing from a Retail Store’, as a case analysis in the book International Retailing: Text and Readings Shri. S.L.Gupta and Shri.Arun Mittal and published by Excel Books. ISBN: 9788174468598. Nambiar, B.K. (2010) book review on ‘Introduction to Management Science A Modeling and Case Studies Approach with Spreadsheets’ authored by Frederick S.Hillier and Mark S.Hillier, third 2009 edition, SCMS Journal of Indian Management. Nambiar, B.K. (2011) ‘A Qualitative Analysis of Implicit Noise Factors in Marketing Communication’, International Journal of Retailing and Marketing, ISSN 0976-318X. Nambiar, B.K. (2011) book review on ‘Applied Case Studies in Marketing’ authored by S. Shajahan, 2011 Edition, SCMS Journal of Indian Management. Nambiar, B.K.., Joseph,A., and Anandkumar, V. (2012). Using Social media for online customer engagement in emerging markets: A study of private Banks in India, Proceedings of the SIBR- Thammasat Conference on Interdisciplinary Business and Economics Research, Vol. 1. Issue.1 (ISSN:2223-5078). Joseph, A., Nambiar, B. K., and Anandkumar, V. (2012). Using Social Media in Corporate Social Responsibility to Promote Environmental Sustainability, NIPM Annual Conference, Volume – 2012. BEST PAPER AWARD - Social Media as a Brand Communication Tool for Global Brands in Emerging Markets: An Indian perspective, presented at the 2-day National Seminar on ‘Emerging International Business Order’ at Cochin University of Science &amp; Technology, Kerala. Awarded University rank in Masters in Business Administration from Madurai Kamaraj University. Awarded best outgoing student in MBA department in Business Administration from Madurai Kamaraj University. International Marketing course for MBA students from University of Hyogo, Japan who visited the campus to attend the management classes on an exchange program, 2014. Organisational Citizenship course for MBA students from University of Hyogo, Japan who visited the campus to attend the management classes on an exchange program, 2015. Branch Managers of KSFE, a giant Non-Banking financial conglomerate, fully owned by the Government and one of the most profit-making public sector undertakings in the state. A two day Training Program and Workshop on Empowering Store Managers for Retail Excellence for Retail Store Managers on 2-3 May 2016. ‘Getting the Message Across: Sexual themed Advertising and Young Adults’ at the International Conference on Marketing Technology and Society (MARCONF16) at Indian Institute of Management Kozhikode on 29 September – 1 October, 2016. Doctoral thesis at National Conference on Doctoral Research, Christ University, Bangalore, August 05, 2016. ‘Critical Appraisal on Perceptual Influence of ServQual in Retail Banking for a tailored CRM’ at the NCIM 2016, Rajagiri Centre for Business Studies, Kochi, Kerala. ‘Adoption of CRM Initiatives for Entrepreneurs: Reshaping the Customer Centric Model in Kerala ’ in a UGC sponsored National Seminar on Role of Entrepreneurship in Economic Development of India at St. Paul’s College, Kalamssery, Kochi, Kerala. ‘CRM in Retail Banks in Kerala ’ at the two days International Conference on Indian Financial Sector on the Global Financial Landscape, SCMS Cochin School of Business, Kochi, Kerala. ‘Adoption of Information and Communication technology in the Banking Sector: Service Augmentation of ATM Marketplace as a Customer Channel in Kerala’ at the two days National Conference on Value Creation in Services: Issues and Challenges, FISAT Business School, Kochi. ‘Social Media Empowers Customers – a New Marketing Paradigm’ at the International Workshop on Managing Challenges in Emerging World Order and Winning Strategies for Sustainable Development, Bharat Mata Institute of Management, Kochi. ‘New Age Marketing Communication: Innovation to face the challenges in Adversities’ at the two days AIMS International Conference on Management, IIM Bangalore. ‘Customer Relationship Management: a Driver for change in Tourism Marketing’ at the two days International Seminar on ‘365 Days Destination’, Cochin University of Science &amp; Technology, Kochi. ‘A Study on the Impact of Infomercials on Consumer Learning with Special Emphasis on Teleshopping Products’ at the two days National Conference on Communication in Global Business…the Changing Spectrum, Rajagiri School of Management, Kochi. ‘Managing Brand Integration in this Economic Slowdown’ at the two day 2nd International Conference on Leadership and its Role in Preparing the Organization for Unprecedented Change, Institute of Productivity and Management, India.